While it was extensively reported previously that Trump is set to slap China with new tariffs as soon as Friday (here and here), there were few actual details what this latest escalation in the trade wars would entail. Moments ago, CNBC provided some much needed clarity, when it reported that list of products subject to new tariffs is expected to include between 800 and 900 products, slightly less than the original list of about 1,300 products published by the U.S. Trade Representative in April; still, the dollar value of goods subject to protectionism remained unclear. Trump would make a final decision whether to impose the tariffs on Thursday afternoon when the president meets with his advisors, however, a CNBC source said the move was "fait accompli." The person notes that the administration has circulated talking points for the tariff actions among 10 government agencies. In addition, a list of products has already been uploaded to a government database for implementation. The White House, U.S. Trade Representative and Treasury Department did not immediately respond to requests to comment. One factor that could influence Trump's thinking is China's response to the possible tariffs. Earlier on Thursday, China's state news agency Xinhua reported that President Xi Jinping told Secretary of State Mike Pompeo that he wishes the U.S. carefully and appropriately handle sensitive issues including Taiwan and trade conflicts to avoid major disturbance to bilateral ties, citing his comments during meeting with Pompeo in Beijing. In other words, Xi urges Trump to "tread lightly"
Xi also said the two nations should increase communications and coordination on significant global and regional matters and contribute to world peace and maintain international order; China's president also stressed that Trump-Kim summit is a significant step and sent his congratulations to the U.S. and North Korea o Said that China is willing to keep playing a proactive, constructive role in resolving Korean peninsula issue via political way. That, of course, was a reminder that without China's influence, Trump would never have been able to have a summit with Kim. And while Pompeo expressed appreciation to Xi’s "important" opinion and help on Korean peninsula issue and said the U.S. is willing to work together, he certainly did not say that Trump would not escalate the trade war. Which is ironic, because as we said yesterday, it was the summit between President Donald Trump and North Korean leader Kim Jong Un this week that ultimately opened the door for the trade war with Beijing, because as we - and Rabobank said overnight - China lost leverage to use its influence on North Korea against the U.S. 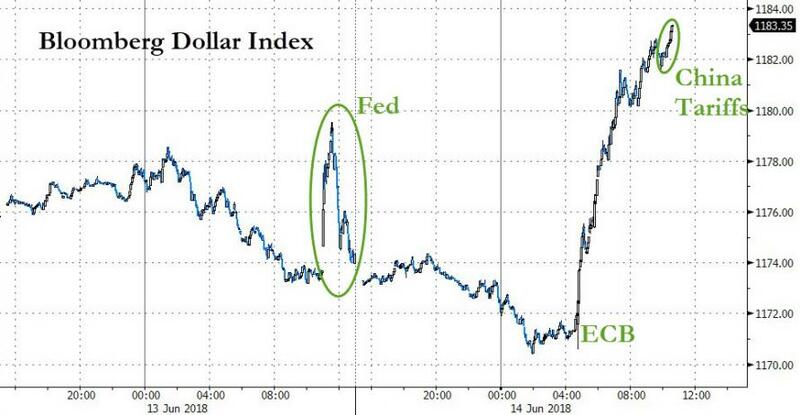 The result, according to Rabobank, would be a much higher dollar, and sure enough, moments after the CNBC report, the Bloomberg Dollar Index spiked to new 2018 highs, seemingly unstoppable even if it means Emerging Markets are about to puke blood.